My experience with shoulder bags has not exactly been great up to this point. 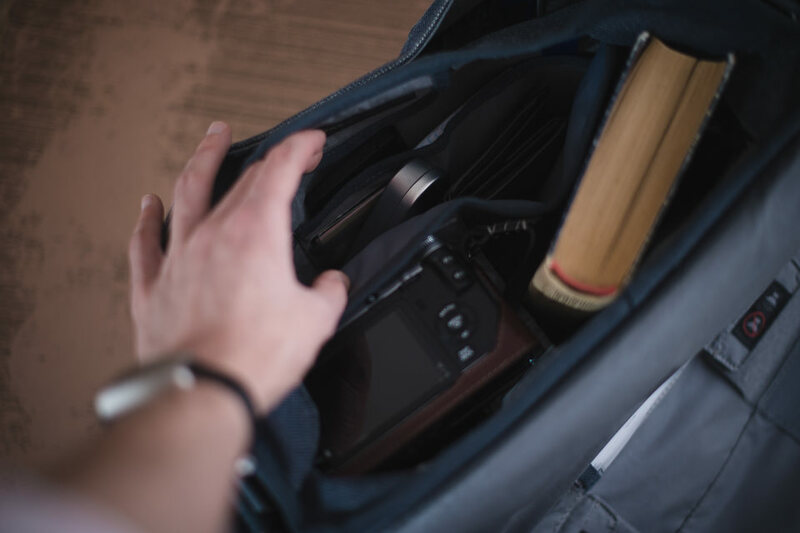 As much as I liked the idea of carrying equipment in a shoulder bag, that convenience of quick access, I’ve not found one that would serve the part flawlessly before. There was always something not quite right – it’s either too square or too wide, the strap – too narrow or likes to play heart-stopping jokes on you. You probably saw the next bit coming. You may even think it to be a cliché of sorts. But, yes, I found the shoulder bag I was looking for. I absolutely adore the Seven. Whenever I use it, I am constantly fascinated by all the things it does just right. Almost as if people who actually do photography came up with the design! So I will go on and say the following: if you need a medium-sized shoulder bag for daily use, just go and buy this. Need a smaller one? Get the Retrospective 5. Need a larger one? Get the Ten or Twenty. It’s great, and I can’t see someone not liking it for all the things it does well. All I really need for a day out. Disclaimer: the bag was sent to me by Think Tank specifically for reviewing purposes. That said, the manufacturer has absolutely no effect on my impressions and, as always, my words are my own. I’ve done several reviews of different sorts so far, I’ve been harsh and complimenting. If you find this particular review to be a bit too positive, well, that’s because I find the Seven to be unexpectedly good. At just about everything. 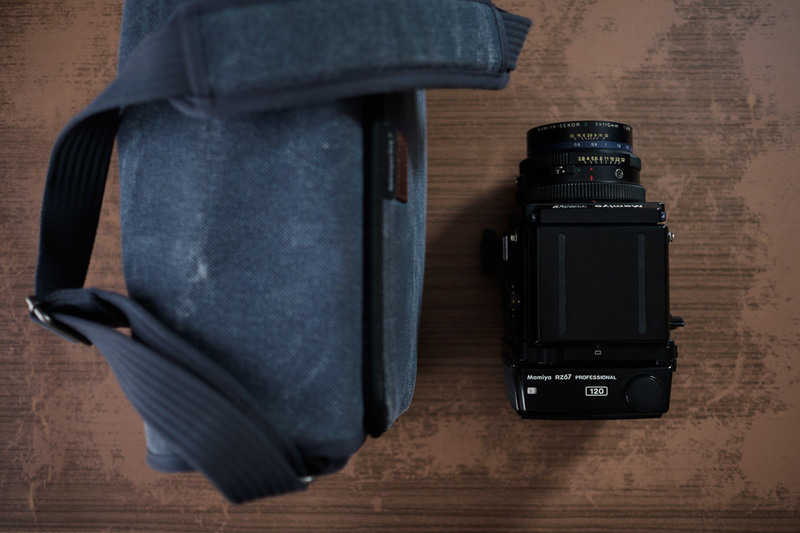 Perhaps there is no “perfect” camera bag (or at least we’ve not found one yet), but there are perfect bags for certain requirements. Me, I needed a shoulder bag that would handle work as well as casual strolls in the Old Town of Vilnius. 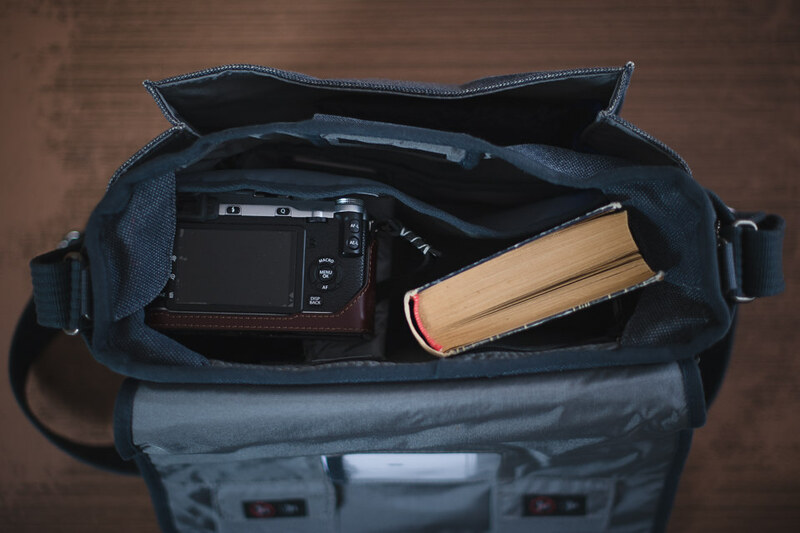 So, on one hand, it had to fit a medium sized full-frame DSLR with a couple of lenses and a mirrorless camera mounted with another lens; on the other, it had to easily accommodate the mentioned mirrorless camera with a book and some light snacks. A compartment for an ultrabook/tablet was also a necessity since my work involves not only photography, but writing as well (often “in the field”). That means appropriate charger, too, as well as the usual possessions such as my wallet and mobile phone. So, it needs to be quite spacious. At the same time, not too much so. What compartments there are, I want to use, and if I am not, the bag could be smaller without them. Finding such a sweet spot – large enough for work, small enough for daily use – is certainly no easy task, and I spent quite a lot of time deciding between the Retrospective 7 and 10. Interestingly, the biggest difference between the two is not the size. In that regard the two bags are very similar. What is different is the shape. The Ten is a bit more square, and the size of the tablet compartment also is a little different. In the end, I chose the Seven thinking the larger version is just unnecessary. And so it turned out that, for my needs, I got the sweet spot. At this point I do think it’s worth mentioning a small issue with Think Tank’s lineup. Choice is a good thing, but in the case of Retrospective bags, there might be a bit too much of it. I spent a lot of time going back and forth between the two bags, and even considered larger versions. The Retrospective lineup starts with a 5 and goes all the way to 50 with a total of seven bags, and that’s great, but the difference between some of them seems to be quite minor. The Seven and Ten are very similar, as I’ve mentioned, and the most noticeable difference in practice is perhaps the shape. I wish I had spent less time trying to make up my mind. Being able to try the bags on is a big help. Design is always a very subjective topic to discuss, but that does not mean there’s no general directions that can be distinguished. In the case of this Think Tank Retrospective 7 shoulder bag, the most accurate one-word description I can give is – unassuming. The materials, textures, colours and shapes used are all very subtle and simple, and even in isolation I compliment such an approach. But the Seven does one better and gives a strong impression of sophistication, too. One of the biggest pluses for me is that the shoulder bag does not look like one meant specifically for cameras. In other words, it does not scream “I am carrying something expensive, why don’t you steal me?”. At the same time, once you unfold the extremely simple and clean cover, there are no practicality penalties to be found. Just a shoulder bag. Classic and charming somehow, wouldn’t you say? I believe that, by refusing to cover the exterior of the bag in pockets and zippers, Think Tank chose the safe, classic look, and Seven (and by extension, all the other Retrospective size versions) is no worse for it. But don’t think that by not including such visual (and, of course, practical) details, Think Tank was lazy and skipped design whatsoever. Look a little closer and you will notice the comfortable-feeling proportions of the bag, the muted, subtle colours, the warm, “organic” materials and textures used. It’s not as styled and, arguably, not as beautiful as some Ona bags, for example. On the other hand, I can easily imagine someone hating the mentioned Ona bags from design perspective, but can hardly see someone feeling such strong negative emotions towards the Seven – it’s just not as pretentious in that regard. 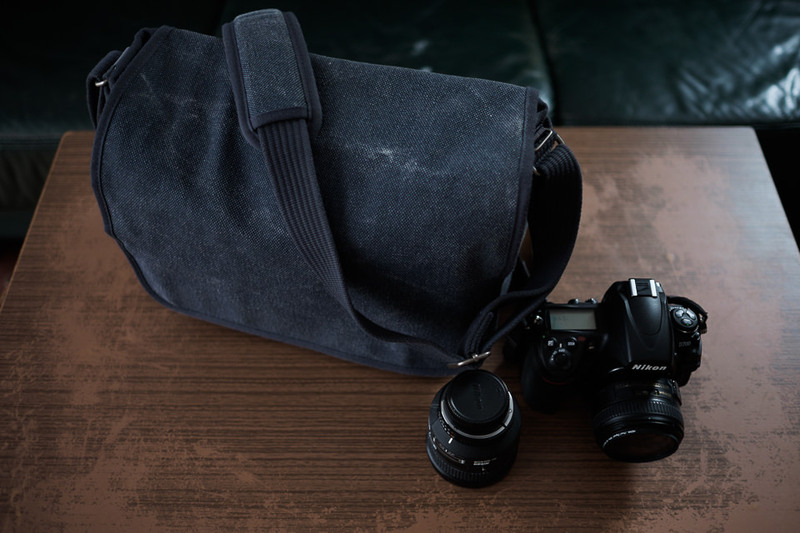 In fact, that is perhaps something I love about the Retrospective the most – yes, I can see myself being tempted by a more stylish camera bag, but the outright honesty of the Seven is undeniably charming. Look a bit closer, though, and you start noticing the sophistication behind the simplicity. The pattern of the material is beautiful and “warm”, it’s not your regular black camera bag screaming of expensive equipment inside. Behind the simple looks also lies genuinely high quality. And look – my beloved Surface fits in perfectly. Almost as if designed with it in mind, no less. iPads and small laptops will be comfortable there, too. Exterior-wise, it’s just a shoulder bag, and I mean that in the most positive sense of the word. It does not attract much attention at first glance, but if you look closely, it is a very well sorted and sophisticated-looking object. The colour options – Pinestone, Black and Blue Slate – are all also quite muted, understated and compliment the looks well (I have the Blue one). Dig a little deeper, though, and you will be even more pleasantly surprised. Most manufacturers cut corners in one area or another. Quite often, the corner-cutting is noticeable, if not exactly objectionable. Rare few manage to design a tool or a product that feels every bit as or more expensive than it is. For example, the Fujifilm X-E2 that I own feels very high quality everywhere you touch, except the base where magnesium meets plastic body panels, and the thumb dial which is made from seemingly very cheap plastic. The Retrospective 7, from my experience, is one of those few products where the manufacturer did not end up cutting significant corners, or at least managed to hide it really well. During the several months of use, I did not find a single cheap feeling stitch – this is a properly made shoulder bag and everything you touch feels quite premium. More than that, the Seven managed to shrug off any abuse I might have thrown at it with ease and remains in pristine condition after almost daily use for two months. There are no noticeable traces of it being extensively used and I am certain it will serve for quite a few years. It feels exceptionally rugged and strong. The strap is quite wide and very thick, but still comfortably soft to use. 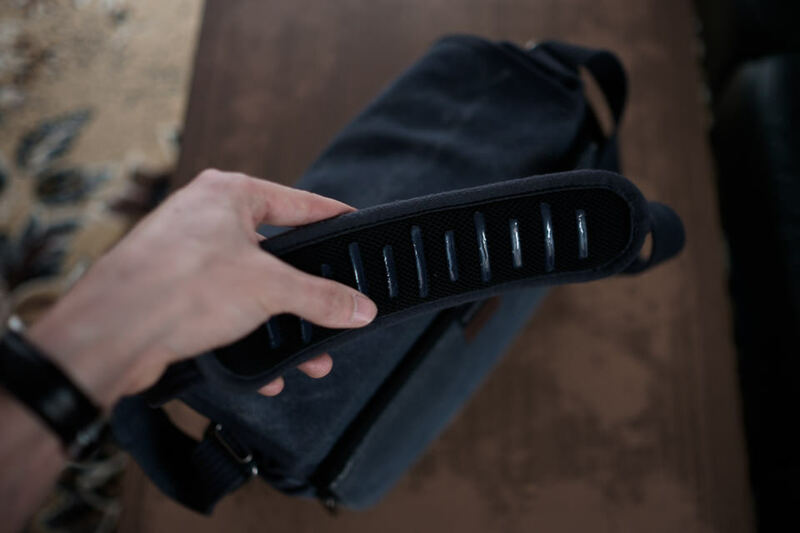 The padding on the strap is thicker still, so much so I was very surprised the first time I grabbed it – and it’s very comfortable, too, masking the weight of a fully-packed bag brilliantly. The underside of the padding has a rubber pattern to keep it from sliding off your shoulder, naked or otherwise. The silicon is quite soft and no matter the surface of contact or weather, does its job very well, the bag stays on the shoulder securely. Overall, all the materials used are quite thick and give a sense of very high quality. Even the padding inside gives the sense of rigidity and quality. The zippers are easy to undo with one hand and the velcro is showing virtually no signs of wear. 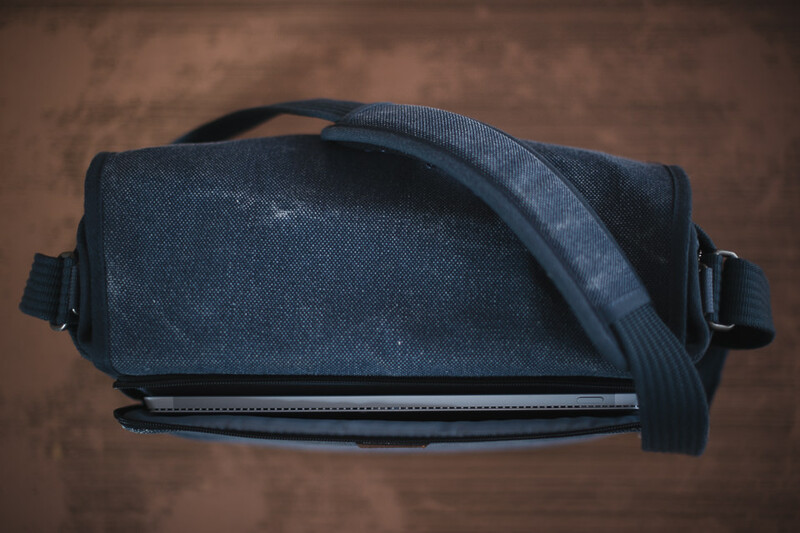 If you remove the separators from the main compartment, you are still left with a padded shoulder bag that offers good protection and does not become a formless mush. If I ever had the feeling of something being very much worth its price, this is certainly one of those cases. Weight: 2-3 lb (0.9-1.4 kg), depending on the number of separators, etc. If, like me, you tend to travel light either to work or for pleasure, the Seven is of great size. It will fit a DSLR, a mirrorless camera and a couple of small-to-medium lenses in a pinch, plus that tablet/laptop and a few other carry-ons, such as your wallet and a mobile phone. Don’t expect to fit half your studio there, though. It’s spacious, but it’s not magic. The numbers really don’t say much. After all, it’s not a box, it’s a bag, and some of the dimensions depend a lot on what you are carrying and how. The best way to describe it is to say this is a normal shoulder bag. It’s not big, nor small. It does not look as if it is meant for a specific purpose, say, to hold a lot of equipment. It could just as well be a student’s shoulder bag to carry books and a bag of chips. That said, you can fit a surprising amount of equipment in. Hopefully, the product shots that I took will help you get a good idea of how large it is. It is very practical, that I can say, and I don’t just mean the arrangement of separators. There are quite a few pockets in there: two outer and two inner side pockets; the small laptop/tablet compartment; an A5 sized notebook or notepad compartment inside with a zipper; main equipment compartment; another inside compartment for wallet, caps, pens, small notebooks and accessories with appropriate pockets; outside pocket where the rain cover is found, and it is large enough to hold a speedlight. Oh, and there is a see-through business card pocket on the inside of the main cover, too. In short, I can’t think of a better way to use the available space. There is pretty much a place for just about anything you’d want to carry with you, within reason. I am even more impressed with comfort. The strap does not get twisted or entangled. It’s quite wide and very thick, but still soft at the same time. Adjusting the length is easy and, once set, it stays in place securely. You can slide the shoulder pad up and down with ease, but it does not slide around on itself as there is quite a lot of friction between the bad and the strap. Oh, and that pad has a lot of give, it’s thick and firmly shaped, but also very soft even under heavy load. Very, very well judged. I’ve never been worried the bag might slide off my shoulder even when I was wearing a jacket thanks to a pattern of soft and grippy silicon rubber. When loaded with equipment, the bag stays level and does not tilt, so it won’t rub against your leg unpleasantly. 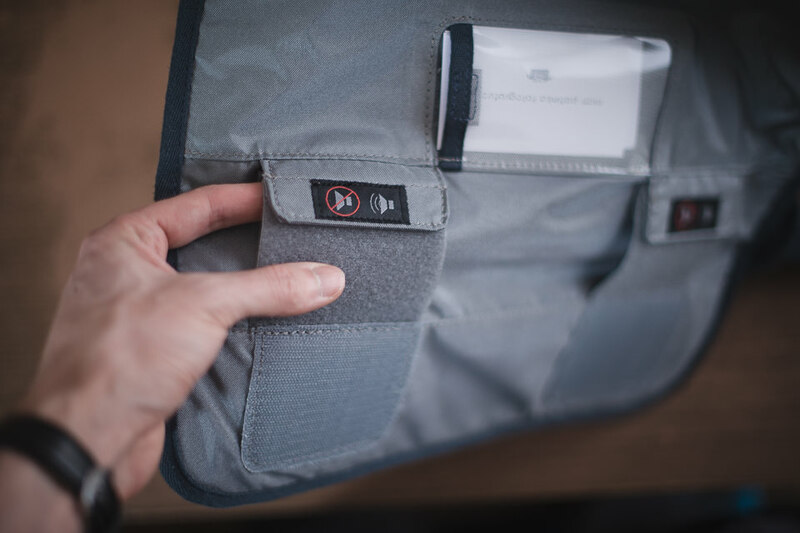 The tablet compartment’s zipper is very easy to undo with one hand, although you may find yourself needing two to undo the main cover as the velcro is quite strong. See those little flaps on each side of the main compartment? You can use them to stop your equipment from falling out, they are just firm enough to keep everything in place. The bag itself does come with more separators than just that one I have installed. And also with a removable carry handle, which is neat, but looks a little out of place. I took out the separators and removed the handle the moment I unpacked the Seven. And I’ve no idea where they are now. By the way, see that big pocket? That’s where the rain cover is should you ever need it. The Microsoft Surface Pro 3 slides right in. That pocket is its home now. It will also fit an iPad or a thin 11-inch-or-so laptop. Overall, I could find absolutely no fault, and it almost doesn’t feel right. No product, no thing I’ve ever used was this flawless at what it was supposed to be and do. The Retrospective is just so well thought through, it’s hard to believe. 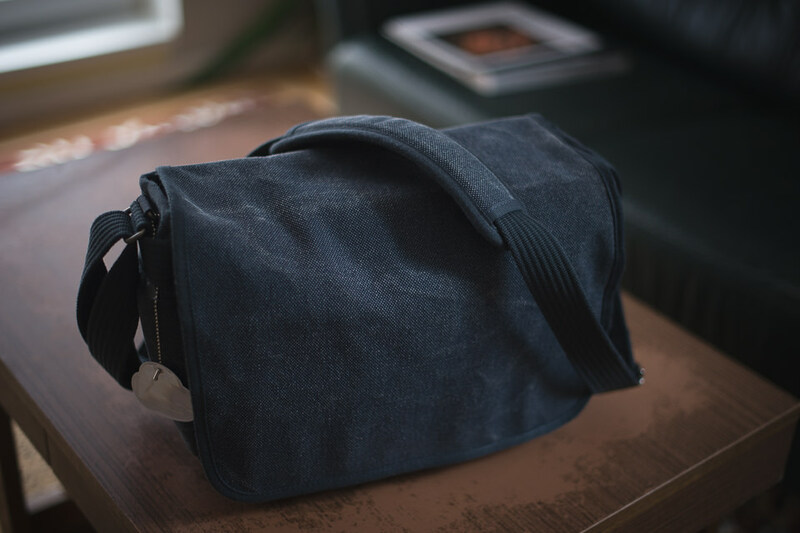 I fully realize I’ve been praising this product like crazy so far, but Think Tank really did come up with a very good shoulder bag, though that’s just my opinion. There was not a single moment where I thought – “what on Earth made them do that?”. Everything feels refreshingly well made and well designed. It should not be so surprising, but is, and that’s a stone in the garden of so many other manufacturers. Not just those that make camera bags. This is as clever as it is simple. Think Tank is the Volkswagen of camera bag world. Might not be overly exciting, but they do think of everything. Forget cringing in quiet environments every time you need to access the contents of your Seven. Just fold the velcro and engage Bresson mode! Basically, as you can probably figure out, the velcro on the main cover can be folded so that, when you close the bag, it doesn’t “stick”, and thus can be opened silently afterwards. In fact, pretty much every bit of the tape used to secure different compartments can be “silenced” like that. Very useful in sound-sensitive environment, such as churches or concert halls. Finally, there are a couple of straps inside the bag that you can use to attach something, like keys or memory card case so that they don’t get lost. One of the straps is, by default, attached to the rain cover. These little touches make the already great shoulder bag even more impressive. No other section of the review required me to think quite as hard. It was that difficult to come up with something that was not done well. And you know what? I failed. The only minor complaint that I do have (and it’s not really much of an issue) is the weight. The fact such high-quality and thick materials were used for the bag means it’s hefty. But even that is relative, as it’s not heavier than you would expect given the materials used. And… Yes, the business card pocket is quite snug. That’s it, sorry. I adore this bag. 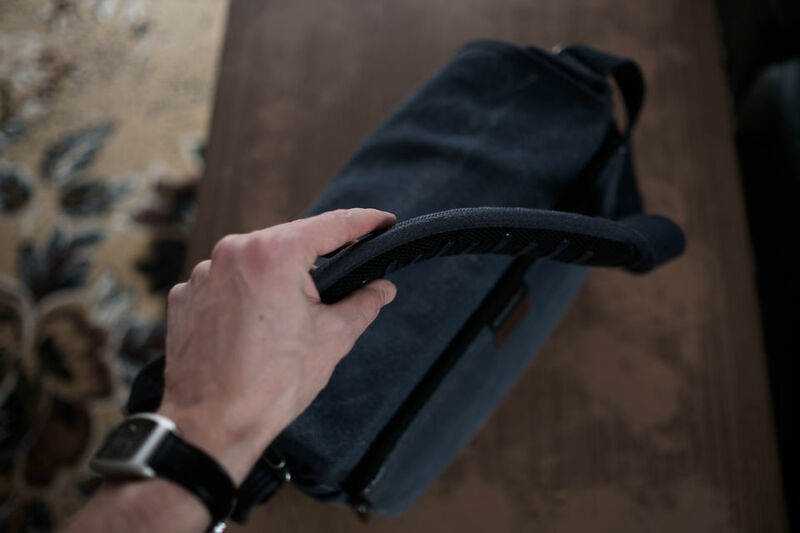 It’s not just good and well thought through as a shoulder bag, it’s an insanely impressive example of how a product should be designed regardless of its function. I could not find a single serious issue with it, a single flaw in any area, be it quality, ergonomics or practicality. Save for the slightly boring, but charmingly honest design, I think it’s as close to perfect for its intended purpose and audience as it could be. If you are looking for a similarly sized shoulder bag, try it out at the very least. There’s a good chance you won’t want to give it up, ever. I know I don’t. very good review romanas! i totally sign your words. I have to agree with you about one thing – it’s definitely not a “looker.” $167!!! Sorry for being a party pooper but at $170, its value is questionable. The large Tenba Messanger (starting at $80) seems to offer much more value. Mark, value has little to do with the actual price, and more with what you get for the money. There are a lot of more affordable bags out there, of course! And they are not bad by any means. The brilliant thing with the Think Tank is that, and I can promise you, this bag is made as well as every single dollar of that price tag suggests. Personally, I don’t see something that’s bigger to be better just because it is bigger. I would not want this bag to be bigger (that is what the Ten and Twenty are for), it’s exactly right for what I need it for. I am using the 5 these bags are the most beautiful soft comfortable bag I have ever owned worth every dollar and then some! I’m thinking of getting the 7 to go with my 5 I’m selling the lowepro bags I have! Thanks for this article, Romanas. I’m always so impressed with your colourful, colloquial English, used appropriately of course to express your excellent insight and knowledge. Glad to see some love for Think Tank products here, which, as you say, really do seem to be designed by people that actually practice photography. A friend of mine recently picked up a used canvas camera bag by a British company for the same price as this item goes for used. Comparing the two, the Think Tank looks better and is far more functional, and based on my experience with their products it will certainly last as long as or longer than the other brand’s shoulder bag. The best photography accessory I own is my Think Tank Airport Security rolling suitcase-style bag. It goes with me on every wedding and outdoor shoot, and barely shows any signs of wear after three years of constant use. it’s always a real mood lifter, to receive compliments. People even sometimes go through all the trouble of finding my email or my business facebook page! But – and I’ve never told this to anyone – the biggest compliment of all is when someone notices the writing itself. Right now, after reading your comment, I am very proud of myself and need to go “humble down”. Ooh, you reviewed my bag! I’m extremely happy with mine. I like most that it doesn’t scream high value gear in here! I can get in/out of it easily. It fits an iPad happily. As you mentioned the quality is superb. Xlnt. thanks for the review Romanas. You’ve ignited my interest. Nice review. Thanks. My only “issue” is the cost, which seems ridiculous. I have had it in my hand walking to the cash register no less than four times, when I would turn around and put it back on the shelf. $160+ seems like a lot for what the bag is, but that’s just me. By far the biggest ‘problem’ is figuring out which size to buy, particularly as bricks and mortar stores are very thin on the ground these days. I know I want a Think Tank, but finding somebody else with one and my exact kit (Fuji X-T-, 23mm 1.4, 56mm 1.2 and 50-140mm 2.8) is impossible. Hey Chris, thanks for the comment and I jump on the occasion cause I have myself a Fuji X-T10 with a kit lens and the new 35mm f2 WR (am getting the 50-140 f2.8 as soon as possible as well). I have the same thoughts as you in terms of size, etc. based on my gear and I came to the conclusion that this is the right bag. I am getting one (you might have gotten one since as well…). You could potentially advice me (if you got this bag) so know if it is good for this type of gear we own? Or did you find a better bag? Romanas – For what it is worth, I am with you all of the way. I use the Retrospective 7 for trips (where I need to have one bag for my mirrorless system plus my iPad) and a Retrospective 5 for things around home (where my iPad and other necessities can go in a different bag). So far, it has filled the bill perfectly and I echo your observations about its well-thought out design and the absence of its screaming that I am carrying expensive equipment with me. Thank you for yet another well written and better thought out review (and not just because I agree with you). First off, great review, Romanas! I am adressing to those who think that 160$+ is a lot of money for a bag. Yeah, it seems a lot for a bag. From my experience, i have often cheaped out on bags and ended up purchasing several ‘so so’ bags at 50$+. I ended up spending more than 160$+ in bags and was never satisfied. I bit the bullet about two years ago and purchased the Retrospective 7. I can say that i have never looked back nor do I have any desire to purchase another bag since. It is every bit as great as Romanas has so eloquently put it in his review. Two years on, with abuse and travels, the bag still looks as good as new. My point is, you have to look at it longer term. You will get years of usage out of this bag and may not need to purchase another one. It’s versatile, tough, hold a hell of a lot of gear, looks unassuming, and very well made. Any one of you that will purchase this bag (for it’s intended purpose as a shoulder bag) will not regret it years down the road. it fit D750 with 24 120 F4 attached, tamron 70 200 F2.8 no hood. and a SB800. i suppose ipad and surface pro 3 can still fit. more room in the front pocket. Thanks for the thorough review, this looks like a pretty ideal bag. 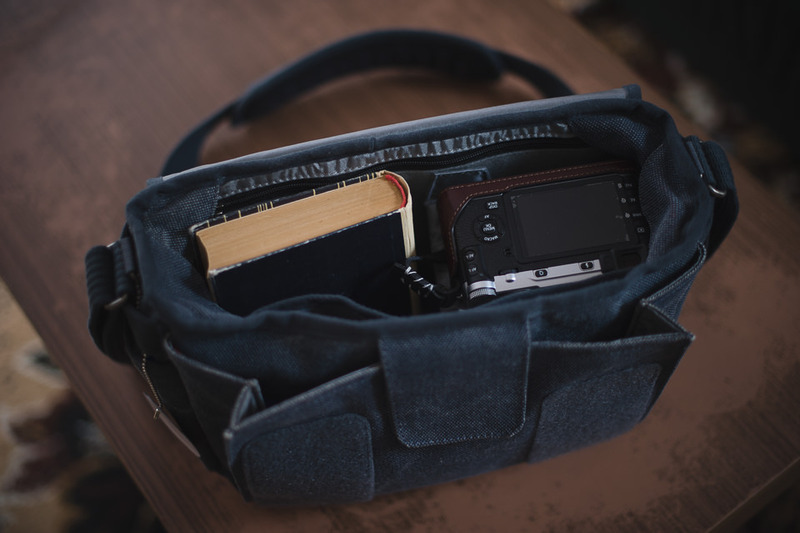 Have you tried/used any other bags out there that you’d recommend, that would fit a camera, 1 or 2 lenses, AND a larger laptop (I can’t imagine my 14″ laptop fitting in this Think Tank). cheers! I’m really not sure how many people actually carry their mobile phones or wallets in their camera bag. I’d think it might not be too practical as a practice. I’m, however, sure that this bag is a very good one for all the reasons you enumerate. I’m sorry to take some of the shine off the manufacturer’s thoughtfulness in designing pockets for personal items frequently accessed. My two cents. I own the Retrospective 20 and there is no doubt it can hold a lot of gear including a mounted 70-200mm f/2.8 in either the horizontal or vertical direction. I find myself using the bag less that I thought however because I find the messenger bag flap that holds everything in the bag to be very large and awkward. Perhaps I have yet to master the technique but I have found the best option for me is to wear the bag such that the flap opens out rather than towards the body. This way it can drape down the outside of the bag while I dig out what I am looking for from the inside. I am also not a fan of the front two pockets because they are only sealed when the main flap is down and covering them. I am just way too nervous that whatever I will have in there will come out as I am shooting and if the flap isn’t completely secured. The only other complaint I have is that I wish the internal pocket that holds all of the smaller items, pens, phones, memory cards etc. was secured with a zipper and not a velcro tab. Again – I just don’t find this to be very secure. It is almost as if this design is better suited to the smaller versions than the larger ones. There is no question it is extraordinarily well built, the shoulder strap is excellent and it can’t be beat for carrying capacity. I purchased this bag a couple of years ago when I bought my Nikon D800. I was in a large camera store in Los Angeles and had a big selection of bags to choose from. I like this bag from the first time I saw it. It was not too large, but big enough for my D800. The bag was not flashy or attention getting, but rugged enough to protect my camera, a couple of lenses and accessories. It is comfortable to sling over your shoulder and the pad on the strap is soft and comfortable. I own other bags and they each have their own pros and cons. I like this bag for carrying a large camera on your shoulder. I remembered your review about the Think Tank Retrospect bag. I have bought and sold for pennies too many bags. I have concluded ther is no perfect bag. But some can be ver good for certain things. I am looking for a bag to suit the same purpose as you and after reading the review I was egear to see the Retrospect bag. I finally was able to handle two of them today, at a camera store in the city. The let me try them for fit with my camera and iPad. I quite liked the 7, runner up was the 5 which was much smaller but I would still need the 7 and unfortunately two bags are not in the budget! Having ha pndeed the bags I agree with everything in your review. They are very fine bags and the feel right when carried. Thought has gone into the design. However there were two things that I noticed that I didnt see in the review. I don’t have your experience in bags, so I don’t know how important they are. The first is the lack of a locking buckle or snap, on the flap. The flap is only secured by the Velcro. Some bags have a type of snap or snaps, under the flap, that can be optionally coupled, to make it more difficult for a thief to rip open the flap and grab contents. The other thing I noticed was there are no quick disconnect fasteners on the strap. It cannot be easily removed. How important are these things? I don’t know, but I guess I will find out because I’m going to go back and buy the 7. I have owned the 7 for a year now and it is everything you say! I absolutely love mine! WOW! Such a great review. I feel pumped in buying it now! I have a Fuji X-T10 with my 16-50mm and my brand new 35mm f2 WR, plus my Ipad and my Macbook Air 11” and per your review, I can’t ask for a better bag to protect all my stuff! Now can I ask you a question? I can tell you know what you’re talking about and it’s important in making my final decision on this: Do you think this can fit as an “everyday” messenger bag? Meaning, my dream (as per say) is to be able to have my camera with me – even with minimal gear such as my 35mm lens only for street and be able to keep my Ray-Bans in my bag at all times as well as put a sweeter some times and even a pack of chips (again – as per say)! Anyways, you get my drift. I don’t want the TR 5 cause it looks FINE for my SLR setup but is just too small for the rest of my stuff. Thank you for an informative review on this product, among a superb range of products by this company. I have the Retrospective 5, which works well for all the qualities raised on this page (and elsewhere on the www). And if I can solve 2 serious problems [cf below] I plan to get the Retrospective 10 or 7 with more space for a couple more lenses. I also have the SpeedRacer which is great for space but gets too big and it’s too obviously a cameragear bag…. This setup caters for my range of research subjects: close ups through to geomorphological subjects that can be inclusive of visible landscapes. Or I can switch to portraits and landscapes; so then I also carry my 135 f2 DC Nikkor, a chunky instrument. The versatility of this bag sure is great…. So I’m happy to deploy it in a first world city etc. 1. Where is the means to secure one’s bag properly to a webbing belt (complementing the carry strap)? I use a military webbing belt to carry a gps, leatherman and knife and sometimes geological pick. I secure the bag to the belt with thongs. But here the inner outside of this bag needs clips, or even 2-3 sleeves that thread on to a belt. This lack of added flexibility to secure (and unclip) from a belt (which can also be ThinkTank’s own belt system) is an Irritating Design Fault. I add thongs to the end canvas loops but this is fiddly – so in no ways the ideal fix. Snaplinks also don’t work – they rattle, catch on vegetation, and gouge one. My main gripe here is that a slung camera bag too often swings around one’s body when scrambling up or down steep inclines, and this especially happens when bending forward to examine a biological subject or rock etc…. It is damned irritating…. And for the same reasons I also sometimes secure the camera bag – (Yes, wasting time to tie it manually!!! ) to the top of a small backpack. Here it’s safer and out of the way when climbing with all hands…. 2. DUST!! This is very, very serious Problem, especially that we use digital SLRs. Driving on dirt roads is really bad. Retrospective bags are dust traps!!! Ridiculous!!! Counter to Thinktank’s in so-many-respects-excellent thinking out of designs, this Retrospective range lacks even the modicum of dust exclusion. I Repeat ! Seriously, this is a ridiculous design fault! These Retrospective bags are in DIRE NEED of a flap of material (does not have to be thick canvas) to zip off the entire top of the bag. I want to zip this closed along both long sides – and right across the open top of the bag (under the main flap). Then seal off the shorter opening. So seal in the interior, fully. This use can be optional and so can be folded away. I really hope ThinkThank fix this fatal design fault. And one needs to be able to unzip and fold this longitudinal flap out of the way into the end of the bag, OR fold said dust-cover away internally into its own end compartment. Perhaps like the superb design of my Speed Racer; the 2 parts of the hip-belt into their respective compartments. Think about this ThinkTank, Please! Yes, 2-3 clips to secure a Retrospective to one’s hip belt and/or backpack. But PLEASE sort out the means to zip out DUST! PLEASE! Why the hell should I have to keep in the camera bag in a plastic bag, or cameras in plastic bags in this expensive bag. This is an insane situation??!! Your Verbiage is Wonderful ! You could actually sell Anything … Ha ! Now ~ I never considered such a Simple solution for a Bag. But a Bag serves a Function – and that is primarily to Carry what you need, over a long term – reliably. And this bag seems to best fit your bill – and most probably mine too. 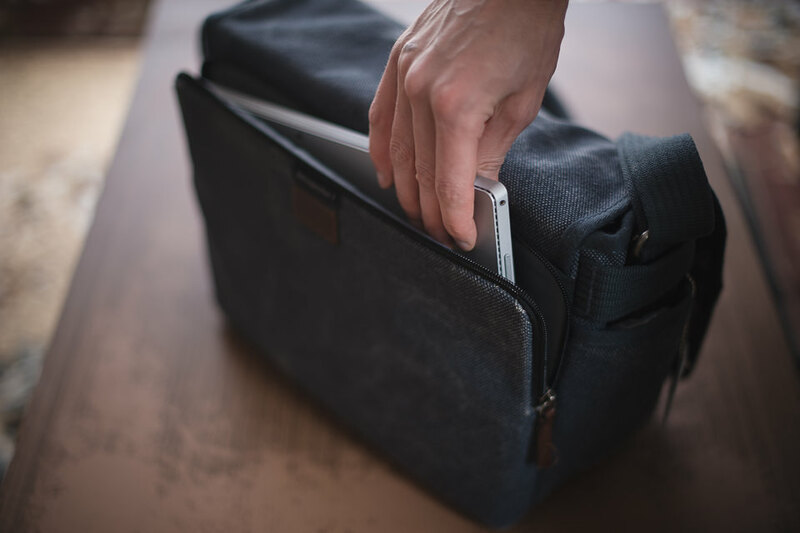 Question _ will this bag carry my Surface Book on the side – like your _3_ ? It is close to a 13″ screen – a little larger and wider than the Surface _3_ which I gave to my grand daughter. Thanks Romanas, your articles are a great Pleasure to read, and enjoy your zeal for Photography . . .